Mobs of villagers in southern China, furious over suspected corrupt land deals, attacked and looted a former official's home and harassed other local cadres, a Hong Kong newspaper reported. Last Wednesday, about 100 villagers in the township of Gurao in the booming Guangdong province surrounded the home of a former village Communist Party leader, Ming Pao newspaper said. "Before we could say much, they barged into the house and robbed it, making off with anything of value. Many things were broken, but it's still unclear how much the losses were," the paper quoted the former official's wife as saying. A widening gap between rich and poor, corruption and official abuses of power have fuelled a growing number of demonstrations and riots around China. The central government has said the number of "mass incidents" - a term that includes protests, riots, petitions and demonstrations - was about 23,000 last year. Corruption is particularly widespread in the real estate sector, where many officials have been found guilty of trying to enrich themselves on land deals. Land prices in Gurao, in Shantou city, were boosted by its famous underwear manufacturing industry - one of China's largest with about 400 factories - and locals had long complained about illicit land sales by officials, Ming Pao said. 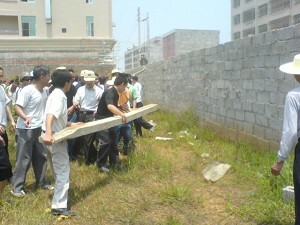 Another party official was surrounded and threatened by hundreds of angry villagers, who also blocked the entrance to the local government offices. And a third party official was harassed by a mob in the middle of the night, the paper said. 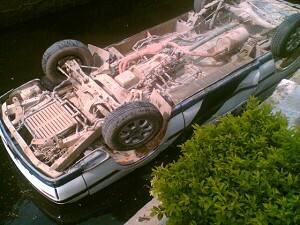 A photograph the newspaper said was obtained from an internet posting showed a flipped police car. No arrests were made and more senior officials were dispatched to pacify the villagers. 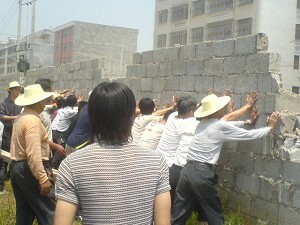 During the May 1st Golden week, many villages in Gurao town saw villagers gathering to demand 'explanations' from cadres. 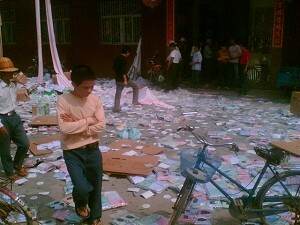 In Huaguang village, the home of former village party secretary Zhang Yuxiong was looted. Zhang's wife informed our newspaper that on the morning of May 2nd, more than one hundred villagers gathered at the house: "Before we could say much, they barged into the house and robbed it, making off with anything of value. Many things were broken, but it's still unclear how much the losses were." Zhang Yuxiong suffered from fright and was still hospitalized yesterday. According to information, the Zhang family called the police afterwards and the local police station sent out investigators. As of yesterday, no one has been detained over the incident. Gurao town Shangbao village party secretary Zhang Yingyong also admitted to this newspaper that when he and his colleagues went to work recently, they were surrounded and threatened by several hundred villagers. the villagers went as far as sealing all the doors and windows in the office and lit joss sticks to smoke them. The villagers only dispersed after the police arrived. However, the police did not take any action against the villagers. According to Zhang, the police had received orders not to take any action without careful consideration. "They said that it might affect social harmony." Zhang had to go to the hospital as well. Also, the home of Xinxing village (Gurao town) party secretary Zhang Quanlin was broken into in the middle of the night by villagers and the family was disturbed. 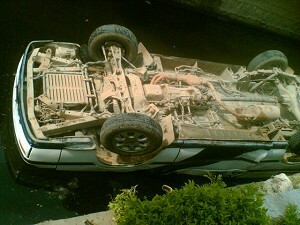 A police car was toppled by the villagers and tossed into a ditch. According to information, the party secretaries of the nine villagers in the town have all gone into hiding. They dared not stay in their homes, which are guarded by relatives who are trying to prevent looting. 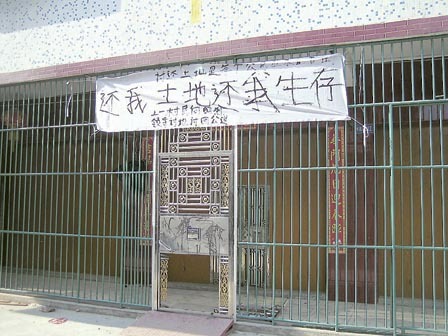 According to information, the villagers are organizing for the Golden Week to end after which tens of thousands of them will proceed to the town government office to demand a solution of the land problem. Did you ever imagine that there will come a day when the police were summoned to a scene of a disturbance but they refused to take action because "it might affect social harmony"? There is a strange détente in the villages of Gurao township. At the home of Shangyi village director Zhang Zhaolie, the family is away and there is only a banner that read: "Give me back my land, give me back my existence." The village government and party offices are basically idle as the officials are staying away. A certain knitting factory was besieged by almost 1,000 villagers who demand the boss to give a full accounting of how he got the land. Meanwhile life appears to be normal, with the shops and schools running smoothly. According to one villagers, "I feel more secure when the officials are not around." There are signs of police presence (see photo of two patrol officers on a motorcycle). 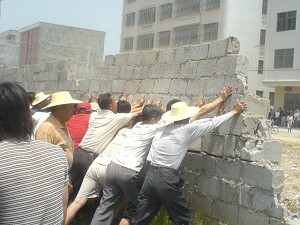 In Shangbao village (Gurao town) where the most serious incident occurred previously, the villagers have changed their target given that the officials have gone into hiding. 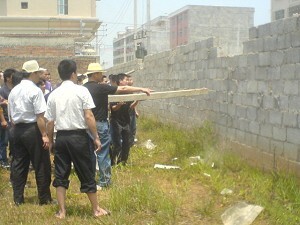 A supermarket owned by a Fujianese had been renting land upon authorization by an allegedly corrupt village official. 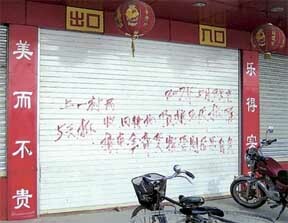 Several hundred villagers surrounded the supermarket on the evening of May 9, and left a threatening note: Close down the business within 5 days or "assume the responsiblity about what happens next." The incidents have also spread from Gurao town to neighboring Tongyu town, where Shenling village party secretary Xu Jiayu is accused of selling land privately to many enterprises. 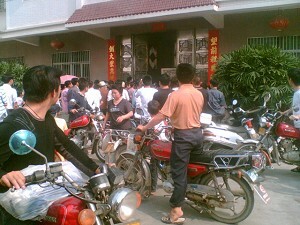 Yesterday, several hundred villagers surrounded the village government office. 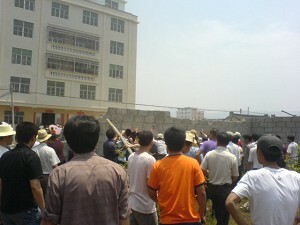 The village government brought in about fifty unidentified men to face off with the villagers. No violence occurred. 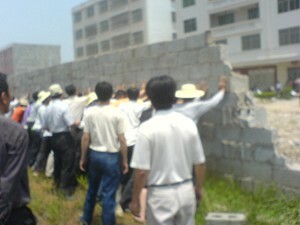 But the villagers turned around to a four-storey factory that was allegedly illegally using public land. The villagers smashed the glass windows in the factory and issued a warning that the factory must move away by May 15 or "assume the responsibility about what happens next." 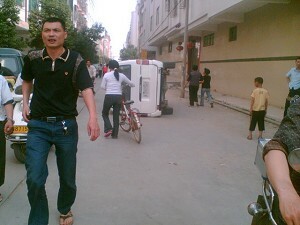 What does the Chaoyang district government have to say, given that these towns and villages are within its supervision? 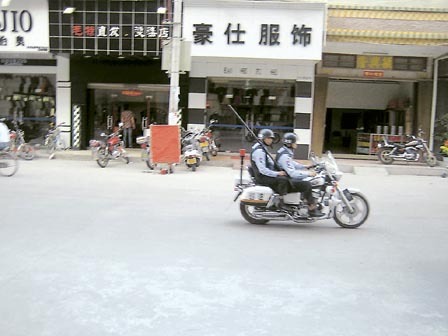 A female worker at the Shatou city Chaoyang district government told Ming Pao by telephone that the district government is paying a high degree attention to the "violent incidents" in Gurao town. Since May 1st, the district party secretary and mayor have gone to the town. She decilned to discuss the corruption of the town and village officials directly, and only said: "This is a historical problem that cannot be solved in a couple of days." They posted wanted posters for two village cadres suspected of illegally selling land and misappropriating public funds.